Portadown teenager Lauren Currie played her part in a landmark match last weekend at Ballymena Showgrounds as Northern Ireland women’s under 17s kicked off the Milk Cup. The friendly fixture between the host nation and Republic of Ireland offered an excellent opening to the summer youth tournament. The international meeting also served as the shopwpiece alongside an inaugural one-day women’s football festival for seven-a-side under 13s. The exciting addition to the Milk Cup calendar handed Currie a welcome call-up to the under 17s after previously proving impressive on duty with two youth age groups. “It was brilliant to be involved in the game against a quality side like Republic of Ireland and a great overall experience,” said Currie. “I have watched the Milk Cup in the past so to be a part of the competition is really great. Football fans in the area will, of course, be familiar with the sight of a Currie between the posts - with the 14-year-old goalkeeper following in the footsteps of her father, Niall. “I remember watching my dad play football and goalkeeper always looked like a fun position,” said the teenager. “I started playing for a boys’ team, Craigavon City, as a 12-year-old then was involved in a Northern Ireland development squad and played for the under 13s and under 15s. “To get selected for the under 17s is great and, hopefully, I will be involved more in the future. “Hopefully, I can take forward some of the tips and the experience I gained with Northern Ireland. “With the club we have a cup semi-final in Fermanagh this Friday and could also get promoted up a division in the Northern Ireland Women’s Football Association league. Portadown Youth’s Barney McKeown has entered the Milk Cup with sponsorship support from AM PRO Coaching. 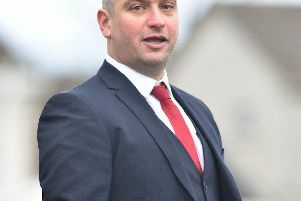 The company under the guidance of Aaron McNeill - who has strong coaching links to Portadown Youth - will back McKeown for a second successive season. “I am delighted to be able to support Barney as he continues his football journey,” said McNeill. “Barney has had a fantastic year with a number of personal achievements. “He has represented Club NI against Manchester City and Real Madrid. “He has also been across to Everton and played a number of games where the feedback and reports have been very encouraging. “I will continue to work closely with Barney over the next 12 months to support his ongoing development plan.